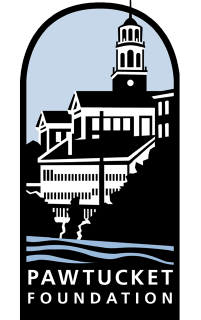 On October 25, 2000, 25 artists led by Pat Zacks met at Slater Mill for the first time to establish goals, bylaws, membership dues, a mission statement, a logo, and a web site and formed Pawtucket Arts Collaborative. There are 96 members of Pawtucket Arts Collaborative (PAC), with a network of over 193 artists and art supporters. PAC made a formal presentation on April 25, 2001 requesting funding of $10,000 from the City of Pawtucket to establish a line item for “all arts organizations in the city of Pawtucket” to be eligible to receive city funding. Greater Than The Sum of It’s P’Arts as part of Pawtucket Convergence. 32 PAC artists participated in this exhibit. Acquisition of permanent art gallery space in the Blackstone Valley Visitor’s Center, 175 Main Street, Pawtucket. Design and installation, a collaboration of Morris Nathanson, PAC, the City of Pawtucket Planning Dept. and Exhibit ‘A’ Design Group. Open Studios – 250 Esten Ave., Pawtucket. Participating artists: 2nd floor – Allison Kyner (painting/works on paper); 3rd floor – Anisa Raoof/Anisa Designs (metal clocks/mirrors/ frames/jewelry; Marion Christ/SlapJack Designs (vintage playing card mirrors); Mindy Cherry/Hobowear (fleecewear); Amy E. Wynne (painter/sculptor); 4th floor – Plato (custom leather artisan/handbags homegoods). Through PAC initiatives, the Pawtucket City Council voted unanimously 9-0 in favor of a line item “arts funding”, which will allow any non-profit group in the city of Pawtucket to apply for funding for the arts. An award of a total of $10,000 has been allocated for the arts for the 2003 fiscal year. Through the efforts of State Representative Mabel Anderson, PAC was awarded its first state legislative grant in the amount of $5,000. PAC’s first exhibit at the RI Watercolor Society. 30 PAC members participated in this “Mixed Media Exhibit”, with a total of 72 pieces of artwork displayed. In 2002 there are 116 PAC members along with a network of over 350. City of Pawtucket put out requests for arts funding. The Pawtucket Arts Panel committee was established, and $10,000 in funding was made available for application to any artist or arts project in the City of Pawtucket. Among the awardees was the Pawtucket Arts Collaborative who received $1,500 for a Holiday Open Studio Stroll. PAC rents the office at 260 Main Street, Pawtucket, in the city’s “Arts and Entertainment District” tax-free zone, providing a place for collecting artwork and organizing exhibits, a location for meetings, classes and information. With the assistance of art teacher, Don Chabot of the Curvin-McCabe School in Pawtucket, Marianne Purviance, Mimo Gordon Riley and Gretchen Dow Simpson work with the students during 2002-2003 school year to paint a 50 foot long map of the world in color. Students were able to visit the artists in their studios across the street from the school. In 2003 PAC has 130 members and a network of over 450. Flora and Fauna exhibit in the Pawtucket Arts Collaborative Gallery. 15 Members participated. Panel: Making a Living as an Artist (part 1). Sara Agniel, Owner, Gallery Agniel. Penny Faich, Kiln Formed Glass Artist. Meredith Younger, Head of Ceramics at the Steel Yard. Gretchen Dow Simpson, Painter. Panel: Making a Living as an Artist (part 2). The Business of Art. Mimo Gordon Riley, Painter. Jim Watkins, Glass Artist. Valerie Tutson, Storyteller. Loren Chen, Potter. INSIGHTS: a Lecture. Monica Shinn, painter, discusses her art. Panel: The Basics How to Market your Art: Luca del Borgo, photographer. Paula Martiesian, painter. Harley Bartlett, painter muralist. William Culbertson, sculptor. owner, director, jewelry designer MARTINA Company. Bonnie Turner, muralist. Cliff Clear, muralist. Panel: Making a Living as an Artist Part 4: Martie Holmer, artist/educator. Robin Blossom, photographer. Chris Kane, sculptor. Dorothy Bocian, art administrator art agent. Annual Open Juried Exhibit: Painter Merle Mainelli Poulton as juror. The Free Hand, Pawtucket Arts Collaborative call for drawings. Silvia Acosta, artist and architect, as juror. Third Annual Multicultural Juried Exhibit, Art Unites. Award Winners: Pawtucket Foundation Prize of $2000 to Astra Wijaya, photography. Pawtucket Arts Collaborative Award $200 to Dusan Petran, sculpture. People’s Choice Award $150 to George Garcia, sculpture. In July 2013 there are 148 members. Built in the turn of the century, Lorraine Mills is a 325,000 Square foot complex. 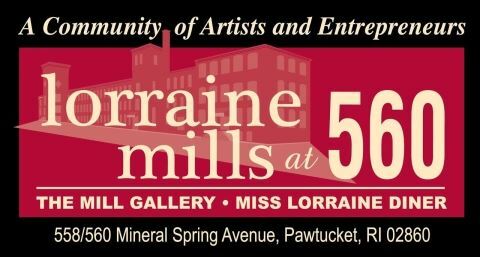 Now a bastion for Rhode Island artists, craftspeople and businesses, Lorraine Mills is also the host for the Pawtucket Arts Collaborative. The Mill has large, small, and shared work studios available for artists of all ilks — from sculptors to painters to silk-screeners, dancers to graphic, fashion and interior design! Join a unique collection of working artists in a thriving art community. If you are interested in leasing one of the unique spaces at 560 Mineral Spring Avenue, please call Len LaVoie at 401-751-8428.